Al-Hasakah (Arabic: الحسكة‎, Kurdish: Hesîçe‎, Syriac: ܚܣܟܗ‎, translit. Ḥasake) also known as Al-Hasakeh, Al-Hasaka or simply Hasakah, is the capital city of the Al-Hasakah Governorate and it is located in the far northeastern corner of Syria. With a population of 188,160 residents in 2004, Al-Hasakah is among the ten largest cities in Syria and the largest in the governorate. It is the administrative center of a nahiyah ("subdistrict") consisting of 108 localities with a combined population of 251,570 in 2004. Al-Hasakah has an ethnically diverse population of Kurds, Arabs and Assyrians and a smaller number of Armenians. The Khabur River runs through Al-Hasakah and the rest of the governorate. Al-Hasakah is 80 kilometres (50 miles) south of the Turkish border-city of Qamishli. The Khabur River, a tributary of the Euphrates River flows through the city, downriver from Ras al-Ayn, another border town. The Jaghjagh River flows into the Khabur River at Al-Hasakah. In the city centre, an ancient tell is identified by Dominique Charpin as the location of the city of Qirdahat. Another possibility is that it was the site of the ancient Aramean city of Magarisu, mentioned by the Assyrian king Ashur-bel-kala who fought the Arameans near the city. The etymology of Magarisu is Aramaic (from the root mgrys) and means "pasture land". The city was the capital of the Aramean state of Bit-Yahiri invaded by Assyrian kings Tukulti-Ninurta II and Ashurnasirpal II. Excavations in the tell discovered materials dating to the Middle-Assyrian, Byzantine and Islamic eras. The last level of occupation ended in the fifteenth century. A period of 1,500 years separated between the Middle-Assyrian level and the Byzantine level. In Ottoman times the town was insignificant. Today's settlement was established in April 1922 by a French military post. After the expulsion and genocide of the Armenians in the then Ottoman Empire many refugees fled to the city and began to develop it in the 1920s. During the French mandate period, Assyrians, fleeing ethnic cleansings in Iraq during the Simele massacre, established numerous villages along the Khabur River during the 1930s. French troops were stationed on the Citadel Hill during that time. In 1942 there were 7,835 inhabitants in al-Hasakah, several schools, two churches and a gas station. The new city grew from the 1950s to the administrative center of the region. The economic boom of the cities of Qamishli and al-Hasakah was a result of the irrigation projects started in the 1960s which transformed Northeast Syria into the main cotton-growing area. The 1970s brought oil production from the oil fields of Qara Shuk and Rumaylan in the extreme northeast. On 26 January 2011, in one of the first events of the uprising, Hasan Ali Akleh from Al-Hasakah poured gasoline on himself and set himself on fire, in the same way Tunisian Mohamed Bouazizi had in Tunis on 17 December 2010. According to eyewitnesses, the action was "a protest against the Syrian government". [better source needed] In 2012, Al-Hasakah, which has a large Kurdish population, began witnessing protests of several thousand people against the Syrian government. From 2013, the militia associated with the Kurdish Democratic Union Party (PYD), the People's Protection Units (YPG), controlled Kurdish districts and government Arab districts. There were also clashes in the city between an Arab insurgent group and the YPG. In the Battle of Hasakah during summer 2015, the Syrian Government lost large areas of control of the city to Islamic State of Iraq and the Levant (ISIL) which were then captured by the People's Protection Units (YPG). Afterwards, some 75% of Hasakah and all surrounding countryside were under the administration of the Federation of Northern Syria – Rojava, while only some inner city quarters were controlled by the Syrian Government. On 1 August 2016 the Syrian Democratic Council opened a public office in Al-Hasakah. On 16 August 2016, the Battle of al-Hasakah (2016) started, with YPG and Asayish capturing most of the remaining areas held by government forces. On 23 August 2016 an agreement between the YPG and the Syrian Army resulted in ceasefire within Al-Hasakah. Al-Hasakah since is self-administered within Jazira Canton in the framework of the de facto autonomous Federation of Northern Syria – Rojava. The Hasakah Security Box is a Syrian government enclave within al-Hasakah, established in August 2016. It contains the prison, immigration office, mayor's palace, police headquarters, and local army command center. Following the second battle for the city in 2015, the Syrian government controlled 25% of the city while Rojava controlled 75%. On August 16, 2016, a small skirmish erupted into the third Battle of al-Hasakah between Asayish alongside YPG and the Syrian government for al-Hasakah. After a week-long battle, Kurdish fighters secured control over 95% of the city. Russia mediated a ceasefire that was put into place on August 23, 2016. Only civilian police officers and interior ministry forces were allowed to return to the Security Box to protect the government's department buildings. In July 2018, the Syrian Army raised the Syrian flag over the Al-Nashwa District that previously was controlled by the YPG and the Asayish forces in the city of Hasakah. Al-Hasakah has a Mediterranean-influenced semi-arid climate (BSh) with very hot dry summers and cool wet winters. In 2004 the city's population was 188,160. Al-Hasakah has an ethnically diverse population of Kurds, Arabs and Assyrians and a smaller number of Armenians. The United Nations estimates that violence related to the Syrian Civil War has displaced up to 120,000 people. There are more than forty mosques in the city, as well as at least nine church buildings, serving a large number of Christians of various rites. 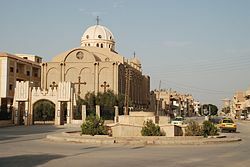 The cathedral of the Assumption of Mary is the episcopal see of the non-metropolitan Syriac Catholic Archeparchy of Al Hasakah-Nisibis, which depends directly on the Syriac Catholic Patriarch of Antioch. The city of Al-Hasakah is divided into 5 districts, which are Al-Madinah, Al-Aziziyah, Ghuwayran, Al-Nasra and Al-Nashwa. These districts, in turn, are divided into 29 neighborhoods. Al-Jazeera SC Hasakah is the largest football club in the city and plays at Bassel al-Assad Stadium. ^ "Al-Kasaka, Syrian Arab Republic :: city code..." Phone Area Code and Dialing. Retrieved 2 January 2017. ^ a b "Kurds Assert Control of Hasakah: The Battle for Rojava (Dispatch 3)". VICE News. Retrieved 13 August 2015. ^ Hartmut Kühne (2010). Dūr-Katlimmu 2008 and Beyond. p. 41. ^ Trevor Bryce (2009). The Routledge Handbook of the Peoples and Places of Ancient Western Asia: The Near East from the Early Bronze Age to the fall of the Persian Empire. p. 439. ^ American University of Beirut (1984). Land tenure and social transformation in the Middle East. p. 5. ^ Antti Laato (1997). A Star is Rising: The Historical Development of the Old Testament Royal Ideology and the Rise of the Jewish Messianic Expectations. p. 107. ^ "انهاء أعمال التنقيب في "تل الحسكة" الأثري". esyria.sy. 2009. Retrieved 18 August 2015. ^ "أخيراً نطق تل "الحسكة" الأثري". esyria.sy. 2009. Retrieved 18 August 2015. ^ "أبرز محطات الثورة السورية خلال الأيام الماضية.wmv". Al Jazeera. 24 April 2011. Retrieved 2 November 2011. ^ "Information on the death of a young man who burned himself in Al Hasakah". free-syria.com. Archived from the original on 30 January 2011. Retrieved 30 January 2011. ^ "Syrian suicider is "Hasan Ali Akleh". Damascus has banned a demonstration in support of Egypt". Middle East Transparent. Archived from the original on 2011-02-05. Retrieved 30 January 2011. ^ "IS-extremisten rukken op in Syrië". Nieuwsblad. 1 August 2014. Retrieved 11 August 2014. ^ Halabi, Alaa (24 June 2014). "Hasakah residents fear ISIS rally in east Syria". al-Safir. Retrieved 11 August 2014. ^ "Inauguration of the 1st MSD office". Hawar News Agency. 2016-08-01. Archived from the original on 2016-08-04. Retrieved 2016-08-03. ^ "Syria: YPG launches assault to take all of Hasaka". Al Jazeera. 24 August 2016. ^ "Agreement to halt fighting in Hasaka enforced at 14:00 p.m". ^ Rojava Defense Units [@DefenseUnits] (23 August 2016). "#BREAKING: Ceasefire agreed in #Hasakah with the provision of Syrian regime and affiliated forces' withdrawal from the city. #Rojava #Syria" (Tweet) – via Twitter. ^ "'I am here': New census in northern Syria seeks to document unregistered Syrian Kurds". Syria:direct. 29 September 2016. ^ "Syrian regime supporters protest against Rojavan federalism in Hasakah". ARA News. 2 October 2016. ^ a b Izat Charkatli (August 23, 2016). "New deal reached for Hasakah in Hmeimim Base". Al-Masdar News. Retrieved January 12, 2017. ^ Rodi Said; Tom Perry (23 August 2016). "Syria Kurds win battle with government, Turkey mobilizes against them". Reuters. Retrieved 23 August 2016. ^ Ralph Ellis (August 23, 2016). "Syrian military, Kurdish fighters reach ceasefire in Hasaka". CNN. Retrieved January 12, 2017. ^ Wladimir van Wilgenburg (August 24, 2016). "Kurds triumph in battle against Syrian regime". ARA News. Retrieved January 12, 2017. ^ Qehreman Miste (August 24, 2016). "Hasakah: Truce reached between Syrian regime, Kurds after Russian mediation". ARA News. Retrieved January 12, 2017. ^ "Syrian Army raises flag over Hasakah district formerly controlled by Kurdish forces". 11 July 2018. Retrieved 11 July 2018 – via Al Masdar News. ^ "Hassakah Climate Normals 1961–1990". National Oceanic and Atmospheric Administration. Retrieved April 26, 2017. ^ "Kurds secure Syria's Kobani as Islamic State targets northeast". Reuters. 28 Jun 2015. 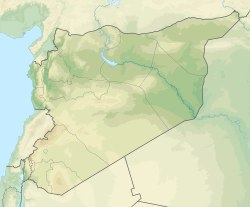 Al-Hasakah Governorate is one of the fourteen governorates (provinces) of Syria. It is located in the far north-east corner of Syria and distinguished by its fertile lands, plentiful water, natural environment, and more than one hundred archaeological sites. It was formerly known as Al-Jazira Province. Prior to the Syrian Civil War nearly half of Syria's oil was extracted from the region. Ras al-Ayn, also spelled Ras al-Ain, is a city in al-Hasakah Governorate in northeastern Syria, on the border with Turkey. The Kurdish National Council is a Syrian Kurdish political organization funded by the President of Iraqi Kurdistan Masoud Barzani and Turkey in the Syrian Civil War. While KNC had initially more international support than the ruling Democratic Union Party (PYD) during the early years of the Syrian civil war and a strong supporter basis among some Syrian Kurdish refugees, the overwhelming popular support the PYD enjoys have shadowed it in Syrian Kurdistan. The Autonomous Administration of North and East Syria (NES), commonly referred to as Rojava, is a de facto autonomous region in northeastern Syria. It consists of self-governing sub-regions in the areas of Afrin, Jazira, Euphrates, Raqqa, Tabqa, Manbij and Deir Ez-Zor. The region gained its de facto autonomy in 2012 in the context of the ongoing Rojava conflict and the wider Syrian Civil War, where its official military force, the Syrian Democratic Forces (SDF) has taken part. While entertaining some foreign relations, the region is not officially recognized as autonomous by the government of Syria or any international state or organization. Northeastern Syria is polyethnic and home to sizeable ethnic Kurdish, Arab and Assyrian populations, with smaller communities of ethnic Turkmen, Armenians and Chechens. The Syrian Kurdish–Islamist conflict, a major theater in the Syrian Civil War, started after fighting erupted between the Kurdish People's Protection Units (YPG) and Islamist rebel factions in the city of Ras al-Ayn. Kurdish forces launched a campaign in an attempt to take control of the Islamist-controlled areas in the governorate of al-Hasakah and some parts of Raqqa and Aleppo governorates after al-Qaeda in Syria used those areas to attack the YPG. The Kurdish groups and their allies' goal was also to capture Kurdish areas from the Arab Islamist rebels and strengthen the autonomy of the region of Rojava. The Asayîş or Asayish is the police force of the autonomous cantons within the Autonomous Administration of North and East Syria. Formed in the early stages of the Syrian Civil War, it had initially been established to police areas controlled by the Kurdish Supreme Committee. In October 2013, the Asayish claimed to have 4,000 members; by 2017, the number had reportedly risen to over 15,000. Jazira Region, formerly Jazira Canton,, is the largest of the three regions of the de facto autonomous Autonomous Administration of North and East Syria. As part of the ongoing Rojava campaign, its democratic autonomy was officially declared on 21 January 2014. The region was established on the Al-Hasakah Governorate formerly known as Al-Jazira Province of Syria. The Eastern al-Hasakah offensive was launched in the Al-Hasakah Governorate during the Syrian Civil War, by the Kurdish People's Protection Units, Assyrian Christian militias, and allied Arab forces against the jihadist Islamic State of Iraq and the Levant, with the intent of retaking the areas of the Jazira Canton that had been captured by ISIL. Subsequently, the Syrian Armed Forces also launched an assault against the radical militants, without coordinating with the Kurds. al-Manajir, often referred to as Manajir, Manajer or Manjar, is a large village in northwestern al-Hasakah Governorate, northeastern Syria. At the 2004 census, al-Manajir had a population of 12,156. As a preliminary result of the ongoing Syrian Civil War, Al-Manajir today is situated in Jazira Canton within the autonomous Federation of Northern Syria – Rojava framework. The Western al-Hasakah offensive, dubbed Operation Commander Rûbar Qamishlo by the Kurds, was a military operation during May 2015 in the Al-Hasakah Governorate, during the Syrian Civil War, conducted by Kurdish YPG and allied forces against the Islamic State of Iraq and the Levant. On 31 May 2015, as most of the offensive operations in the western Al-Hasakah Governorate ended, the part of the offensive in the Ras al-Ayn countryside expanded into the Tell Abyad region, in the northern Raqqa Governorate. The Al-Hasakah city offensive was launched during the Syrian Civil War by the Islamic State of Iraq and the Levant against the city of Al-Hasakah, which was held by both the Syrian Armed Forces and the Kurdish YPG. The Battle of Al-Hasakah (2015) started as an offensive launched in the Al-Hasakah Governorate during the Syrian Civil War, in which the Islamic State of Iraq and the Levant attempted to capture the city of Al-Hasakah, which was divided into two areas held separately by the Syrian Armed Forces and the Kurdish YPG. On 17 July, YPG-led forces captured all of the roads and villages surrounding Al-Hasakah, fully besieging the ISIL militants remaining inside of the city. On 28 July, YPG-led forces and the Syrian Army expelled ISIL from most of Al-Hasakah, with two ISIL pockets persisting near the Al-Zuhour District and the southern entrance. On 1 August, the city was fully cleared of ISIL fighters. NES–Syrian Arab Republic relations concern the military and political relations between the forces of the Ba'athist Syrian Arab Republic and those of the Autonomous Administration of North and East Syria, a de facto autonomous Kurdish-majority region in Northeastern Syria. The Rojava conflict, also known as the Rojava revolution, is a political upheaval and military conflict taking place in Northern Syria, known among Kurdish nationalists as Western Kurdistan or Rojava. 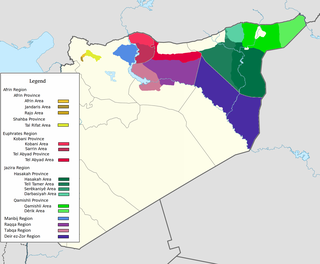 During the Syrian Civil War that began in 2011, a Kurdish-dominated coalition led by the Democratic Union Party as well as some other Kurdish, Arab, Syriac-Assyrian and Turkmen groups have sought to establish a new constitution for the de facto autonomous region, while military wings and allied militias have fought to maintain control of the region. This led to the establishment of the Democratic Federation of Northern Syria (DFNS) in 2016. The supporters of the DFNS argue that the events constitute a social revolution with a prominent role played by women both on the battlefield and within the newly formed political system, as well as the implementation of democratic confederalism, a form of libertarian socialism that emphasizes decentralization, gender equality and the need for local governance through semi-direct democracy. The Autonomous Administration of North and East Syria (NES), is a de facto autonomous region of Syria that emerged from 2012 onwards during the Syrian Civil War and in particular the Rojava conflict. The Syrian Democratic Council is the political wing of the Syrian Democratic Forces in the Autonomous Administration of North and East Syria. The Battle of Qamishli was a violent urban battle between the paramilitary police of the Asayish and the pro-government National Defence Forces in the city of Qamishli, Syria. The Battle of al-Hasakah (2016) was a battle between the paramilitary police of the Asayish and the People's Protection Units (YPG), against the pro-government National Defence Forces and the Syrian Arab Army, backed by the Syrian Arab Air Force, in the city of al-Hasakah, Syria. The al-Hasakah Governorate campaign was a multi-sided military conflict between Syrian government forces, Kurdish forces, armed Syrian opposition groups, and Salafist jihadist forces, including al-Qaeda's Islamic State of Iraq and the Levant and the al-Nusra Front in the al-Hasakah Governorate as part of the Syrian Civil War. The clashes began with the People's Protection Units (YPG)'s entrance into the civil war in July 2012 and spread across the governorate.